We need to analyse the first month of the Aam Aadmi Party government in the office on two counts—governance and politicking. There goes the saying that well begun is half done. However the AAP has perceptibly started on a shaky note in its second innings as the ruling party. Last time, its minority government had lasted just 49 days. This time it has absolute majority but with a quirk of fate, the first month of its government in Delhi saw an indisposed chief minister, sleaze, stings and internal sabotage! In sum, it has been an eventful one month ever since Kejriwal swore in as Delhi’s CM at a public function in Ramlila Maidan on the St. Valentine’s Day this year. Strange it may sound but throughout the first month of the AAP government, Kejriwal remained a non-resident CM, staying at his wife’s official residence at Kaushambi in Ghaziabad district of neighbouring Uttar Pradesh. So much so that even his much touted Janata Darbars — an example of Kejriwal’s knack for playing to the gallery -- were organised near his residence in Uttar Pradesh. Remember Kejriwal’s attempt to organise a Janata Darbar in front of the Delhi secretariat during his first stint as CM last year had ended in a huge fiasco? This time his Janata Darbars are less chaotic and the credit should go to the UP administration for this. In hindsight, isn’t this a classic example of cooperative federalism? (Also consider that it was Kejriwal’s bête noir Prime Minister Narendra Modi who had prescribed him to undergo naturopathy treatment and suggested him to go to Bengaluru). That it is taking more than a month for the chief minister to get a house for himself in his state does reflect poorly on his administration and sense of urgency. It is perhaps the only time in the history of the country that the CM of a state has resided outside his state even after a month of assuming office. Blame it on his ill health that the CM remained absent from the office for ten out of the 30 days of his government, undergoing treatment for chronic cough and high blood sugar at a naturopathy centre in distant Bengaluru. For all practical purposes, it was Kejriwal’s deputy, Manish Sisodia, who held the fort for the government in the last ten days of the first month of the AAP rule in Delhi. In the process, the latter proved himself to be the Man Friday of the AAP Supremo, Kejriwal. The CM used to call him at least once a day while recuperating in Bengaluru. However, unlike Sisodia, the first one month proved that not many in the AAP were prepared to be remote controlled by Kejriwal and that already the party was drawn into a full-fledged bitter faction war. The way the Kejriwal loyalists manoeuvred to remove top party leaders Yogendra Yadav and Prashant Bhushan from the party’s political affairs committee just before Kejriwal’s departure to Bengaluru was reminiscent of H.D. Deve Gowda ejecting his arch rival (late) Ramakrishna Hegde from the party soon after becoming the Prime Minister in the mid-nineties. Both Yadav and Bhushan – co founders and important leaders of the AAP – were accused of sabotaging the AAP bandwagon during the elections – a charge that both vehemently denied. Yet they were left fending for themselves till Kejriwal returned from Bengaluru to signal a thaw in their relationship. Obviously in the game of one-upmanship within the ruling party of Delhi, Kejriwal reasserted his dominance in style. In true Machiavellian style, he took an about turn (not for the first time in his short political career) to yield to Yadav’s plea that the AAP should expand its base and go national. This was a marked departure from his stand that he took barely a week earlier, when he said “I fight a lot in my party when people say ‘we have won Delhi so we can win elsewhere too’. I am not Napoleon who has entered to win…” Yet none can dismiss his soaring political ambitions (http://www.elections.in/blog/is-punjab-the-next-destination-for-aap/). In the first month of the AAP’s government therefore, it was only but natural for an ambitious new party that tasted success early, to witness conspiracies and stings. They were agalore and to Kejriwal’s credit, he moved quickly to nip them in bud. While he promptly tackled the Yadav and Bhushan factor, he moved decisively to suspend former party MLA Rajesh Garg from the primary membership of the party after the latter accused him of trying to poach six Congress MLAs to form government last year when after Kejriwal’s resignation, the state assembly was kept in suspended animation. Garg was earlier denied the party ticket this elections. The Congress’s video tapes of Kejriwal luring its MLAs too surfaced but it was already late by then as Kejriwal was now firmly in saddle in Delhi. 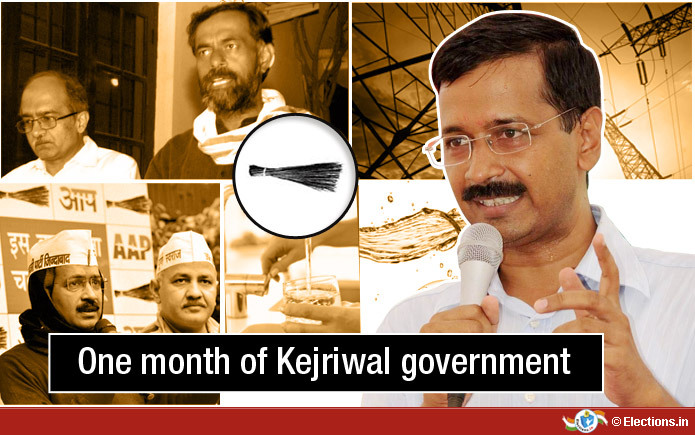 As it is clear, there was much politicking around in the first month of the AAP government in Delhi. On the front of governance too, as deputy chief minister Sisodia told a news television channel, infighting as well as Kejriwal’s absence “impacted” government work. Yet, at least a couple of decisions of the Kejriwal government did go well with the people — a 50 per cent subsidy on monthly power consumption of up to 400 units and 20,000 litres of free water per month to all households. The promise to deduct electricity bill by half and giving free water was made in the AAP’s election manifesto and that the government could upkeep these promises in about ten days of coming to power did held it in good stead with its electorate. A survey on the one month of AAP rule by a private news television channel showed 49 per cent respondents saying that the government had performed well in its first month. Only nine per cent rated the performance of the government as bad. The government is yet to move forward on the issue of Lokpal Bill – over which it had quit last time. Sisodia has claimed that it would be introduced in the Budget session. Yet on another contentious issue of women’s safety, which had topped the agendas of all political parties, there is no deployment yet of marshals in buses from 6 pm to midnight as was promised. One month though is too little a time to judge any government. Given that the AAP manifesto comprised 70-point agenda that ran into 42 pages, to accomplish all its goals, is indeed a tall order for the government. It not only requires a political will, but also concentrated and focused approach. Remember during his oath-taking ceremony on February 14, Kejriwal had said – “I have decided …I will remain in Delhi for (the next) five years to serve only the people of Delhi and try to discharge my responsibilities with the best of my ability.” But can he stick to his words given the fast changing dynamics within his own party and his own expansionist outlook? After all, as we earlier wrote in these columns (http://www.elections.in/blog/is-punjab-the-next-destination-for-aap/), why should he be contented being a small single city leader? As of today, his journey is only a month old and he does have miles to go! The Arvind Kejriwal run government of Delhi has decided to establish better tune of coordination among various civic departments as a number of development work projects are in jeopardy and in disarray. Manish Sisodia, the Deputy and acting Chief Minister of Delhi said that the progress reports of the work underway will be put online to enable the people to view them. The Delhi government on Saturday gave away the orders to various private cab companies and taxi unions to install GPS (Global Positioning System) in their cabs, failing which the fitness certificate will not be issued to the cabs. A senior government official said that the orders are meant for radio cabs and general taxis as well. The Delhi government on Sunday decided to invite public involvement to realise one of its major election promises of providing 'free Wi-Fi' in the city. The Delhi government's advisory body met on Sunday and drew up the plan and prepared a ten point questionnaire for the citizens to reply to and find ways to make the project a reality. The AAP led government in Delhi is planning to get rid of the controversial BRT (Bus Rapid Transit) corridor. To scrap the BRT corridor and review the original plan, four AAP MLAs on Saturday held meeting with Delhi's PWD Minister Satyendra Jain. Jain will meet Delhi Transport Minister Gopal Rai on Monday to reach a rational solution to the problem. Arvind Kejriwal led Delhi government has decided to put the details pertaining to the distribution of ration, ration cards, and the work done by the officials of the concerned departments online to ensure transparency in the functioning of the related department. Asim Ahmed Khan, Minister for Food Supplies and Consumer Affairs said that the concurrent information will be published on the government's website. In a first of its kind, the Arvind Kejriwal led Delhi government on Friday decided to set up a security force only comprising women and meant for women security across the city. The force will be mainly functioning in the areas prone to crimes against women. The Delhi government, led by the Aam Aadmi Party (AAP), is planning to deploy security marshals in the DTC buses plying in the city. The personnel will be on duty in the buses from 6 pm till midnight as promised in its election manifesto. The Aap led Delhi government on Friday announced that it would designate 21 of the party MLAs as parliamentary secretaries. Deputy chief minister of Delhi Manish Sisodia said, “We have decided to put MLAs in governance work. They will be appointed as parliamentary secretary for every cabinet minister”. The Arvind Kejriwal led government in Delhi has decided to give away Birth and Death certificate online from April 1 to ensure increase in efficiency and bring about transparency. Addressing a press conference on Friday, the Deputy Chief Minister of Delhi Manish Sisodia said, "We are trying to make certificates issued from the office of Deputy Commissioner (DC) and Sub Divisional Magistrate (SDM) by Delhi Government online from April 1". The Delhi government on Friday made its decision public that it would amend the act pertaining to the VAT (Value Added Tax), much to the liking of the city traders. The city traders will now be able to carry forward their input tax credit. Led by the Aam Aadmi Party (AAP), the Delhi government has prepared a plan to set up an 'Innovative Vocational University' to enable the youth of the city to get into deserved field of profession. The ruling AAP in Delhi is planning to make Delhi a hub of education and 'revolutionarily' change the way education is perceived, Deputy Chief Minister of Delhi Manish Sisodia said. Arvind Kejriwal led Delhi government has expressed its deep concern over the rising levels of air pollution in the city and thus is planning to get all the main roads of the city rid of congestion, filth and dust. Arvind Kejriwal led Delhi government has taken a decision that it would provide the bureaucrats with greater financial powers and increase them to a full 100 percent to increase the efficiency of its departments. The Delhi government has a proposal prepared to allocate more funds to Head of Departments and Administrative Secretary. The Delhi government has decided to bring about a legislation in the next session of the assembly to monitor and control the fees charged by the private city schools. The so called Regulation of Collection of Fees Bill will propose to form a penal led by a retired judge which will then decide the fees structure of the private schools. Arvind Kejriwal led Delhi government has made up its mind to put forth a notification to stop the purchase, sale and storage of chewable raw tobacco products in Delhi. The AAP led Delhi government on Tuesday faced criticism by the Delhi BJP that it has been unable to curb the swine flu menace in the city. The state BJP called for an all-party meeting and has written to Lt. Governor Najeeb Jung in this regard. No representative of the government has responded to the criticism. The Arvind Kejriwal led Delhi government was slammed by the National Green Tribunal (NGT) on Tuesday for having not submitted its strategy to decongest Delhi roads as yet. The Aam Aadmi Party (AAP) led Delhi government decided on Monday to present a 'Vote on Account' in the assembly to raise funds for the interim period. The Vote on Account will be tabled in the two day assembly session beginning on 23rd March. The Delhi Dialogue Commission (DDC) wrote to the centre on Monday to run cars operated by battery for official work, so that air pollution can be checked. The Delhi Dialogue Commission (DDC), formed by the Delhi government, decided that the appointees of the commission will work as common man as there will be no peons available to move the files from one table to the other or to provide tea to the officials at a call of a bell. Arvind Kejriwal led Delhi government on Monday was scolded by the Delhi High Court for its non-seriousness towards creating awareness amongst Delhiites about laws and offences on children and women. Delhi's deputy chief minister Manish Sisodia, on Sunday, issued stern instructions to city schools to see to it that the boys do not turn rapists. He was of the view that the problem of crime against women needed to be addressed at the grass root level. Acting as the chief minister temporarily in the absence of chief minister Arvind Kejriwal, Manish Sisodia said that in all the city courts, there will be fast track courts set up to hear cases of crime against women. The Delhi government will also implement the recommendations of the Justice Verma Committee to ensure quick justice to women who are victims of sexual crimes. The members of the assembly and the government officials will also be trained to provide safety to the women of the city. Manish Sisodiya, the deputy CM and Education Minister of Delhi urged Union HRD Minister Smriti Irani to bring down the 'No detention policy' in schools to class III rather than class VIII. Sisodia maintained that by having followed the 'No detention Policy' under the Right to Education Act has just brought down the quality of education. Deputy CM of Delhi, Manish Sisodia ordered a magistrate level probe into an alleged incident of denial of entry to a differently-able person into a restaurant. Manish Sisodia, who is the acting CM of Delhi in chief minister Arvind Kejriwal's absence, ordered the Vasant Vihar SDM to carry out an unbiased inquiry into the incident an submit a report to his office. The minister in charge of Delhi, Manish Sisodia the deputy CM said on Saturday that VAT's input tax credit will be allowed now in Delhi. The AAP led Delhi government on Saturday instructed all the tobacco companies to take off advertising boards and hoardings from public places, shops and local vendors. The companies were also warned against distribution of free boards promoting sale of tobacco products. The MLA from Rithala in Delhi, AAP's Mahendra Goyal said that after the thumping victory of the party, 'corruption and hooliganism' were at bay in Delhi. Delhi CM Arvind Kejriwal got admitted into a private Bengaluru hospital to get the treatment for his chronic cough and diabetes. Just a few hours before AAP's national executive meeting, Delhi chief minister Arvind Kejriwal resigned as the party's national convenor on Wednesday. The three BJP legislators in the Delhi assembly on Wednesday filed a complaint with the Lt. Governor of Delhi against the speaker of the house Ram Niwas Goyal for his alleged 'unconstitutional conduct'. The three BJP legislators Vijender Gupta, O.P. Sharma and Jagdish Pradhan alleged that the speaker acted more like an AAP spokesman than the speaker of the house. The Arvind Kejriwal led Delhi government on Wednesday requested the central government to relieve senior IFS officer Sanjeev Chaturvedi. The AAP led government wants Chaturvedi to be designated as an Officer on Special Duty (OSD) to chief minister Arvind Kejriwal. Sanjeev Chaturvedi was sacked in November as the Chief Vigilance Officer (CVO) of the All India Institute of Medical Sciences (AIIMS). The Delhi government led by Arvind Kejriwal asked senior BJP leader VK Malhotra to vacate his official residence. Malhotra has been staying in the bungalow at Bishambhar Das Marg in New Delhi since 1990. The Delhi government has asked for the rental dues as well which are worth Rs. 7 lakh. Government of Delhi on Wednesday made up its mind to reinstate its Anti-Corruption Helpline in the city, following the AAP's 'zero-tolerance' policy against corruption. A cabinet meeting in Delhi secretariat headed by Chief Minister Arvind Kejriwal took the decision. Delhi chief minister Arvind Kejriwal sought on Tuesday a 10 day long leave so that he could undergo naturopathy to get the treatment for his continued coughing and high blood pressure. K.K. 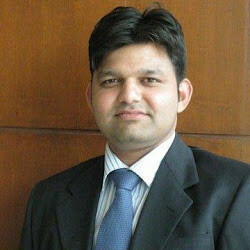 Sharma, presently the Chief Secretary of Goa, was chosen to be the Chief Secretary of Delhi by the Union Home Ministry on Tuesday. Chief Minister of Delhi Arvind Kejriwal on Tuesday said that he was deeply saddened by what was happening in the Aam Aadmi Party (AAP). He said that he was not ready to step into the ugly controversy and would rather try to focus on Delhi's development. The AAP led Delhi government reacted on complaints received against the Delhi Waqf Board. The Deputy chief minister of Delhi, Manish Sisodia ordered the revenue department to carry out an inquiry into the reported irregularities in the board's functioning and report back within seven day. Arvind Kejriwal led Delhi government on Tuesday gave a final chance to the e-rickshaws drivers to get their vehicle registered within next seven days. The government decided to conduct a seven day camp for the registration drive to be successful. Senior AAP leader Sanjay Singh let the media know on Monday that the founding members of the party Prashant Bhushan and Yogendra Yadav might be expelled from the party for their negative remarks on Delhi CM and party convenor Arvind Kejriwal and the functioning of the party. Sanjay Singh also said that there is conspiracy to dislodge Arvind Kejriwal from the post of AAP convenor. Led by the Delhi chief minister Arvind Kejriwal, the Delhi Dialogue Commission (DDC) set up 21 task forces to take care of the proper implementation of the 70-point development agenda of the Delhi government. The task forces will look after the various promises made by the party during elections like free Wi-Fi, installation of CCTV cameras for women safety and so on. Arvind Kejriwal led Delhi government on Monday again stressed to the High Court the need to carry out a CAG audit of the private power companies. Led by the Aam Aadmi Party (AAP), the Delhi government on Monday decided to set up a Public Grievance Management System (PGMS) to redress the issues faced by the citizens. The decision was taken keeping in mind the large number of complaints Delhi CM Arvind Kejriwal received during his 'Janata Darbar'. The internal ombudsman of the Aam Aadmi Party, Admiral Ramdass raised serious doubts over the internal transparency of the party and wrote a letter to the party convenor Arvind Kejriwal and PAC members in this regard. AAP led Delhi government on Sunday rejected the Union Home Ministry's proposal in connection with the appointment of the chief secretary of Delhi. The Home Ministry had proposed a three member panel of former IAS officers to chose one from. Delhi chief minister decided to launch a Revive Yamuna Mission. The Delhi Dialogue Commission (DDC) formed by the AAP chief will look after the drive. The Aam Aadmi Party (AAP) national executive decided on Saturday to offer party convenor and Delhi CM Arvind Kejriwal the veto to reconstitute the political affairs committee of the party. It was being speculated that senior party leader Yogendra Yadav may not be able to hold on to his position when it is reshuffled. Arvind Kejriwal, chief minister of Delhi, was on Saturday allotted a government bungalow at 6 Flag Staff Road, Delhi. The Arvind Kejriwal led Delhi government was allocated Rs. 395 crore by the centre on Saturday. Union Minister of Finance Arun Jaitley made the announcement while presenting the Union Budget in the Lok Sabha on Saturday. AAP led Delhi government expressed its dissatisfaction over the Union Budget on Saturday. The Delhi government said that the share of central taxes was not to their liking. Delhi CM Arvind Kejriwal on Friday paid a visit to the Delhi Police Head Quarters in Delhi, where he evaluated the functioning of the department. Kejriwal gave away his suggestions to the force as to how they can improve the law and order situation and take better take care of women in the city. The Arvind Kejriwal led Delhi government formed a nine member panel on Friday to ensure the implementation of AAP's 70 point manifesto. The panel will be headed by the chief minister himself. The panel will be officially called as The Delhi Dialogue Commission. The Aam Aadmi Party (AAP) led Delhi government said on Friday that if the centre agrees to bear the extra cost, the benefit of the reduction in power tariffs will reach everyone immediately. The chief minister of Delhi, Arvind Kejriwal held his 'Janata Darbar' in Kaushambi, Ghaziabad on Friday, where he met a group of around 20 leprosy patients. The leprosy patients appealed to Kejriwal to speed up the measures for their treatment, which are stuck midway for over a decade. Delhi CM Arvinder Kejriwal held a meeting with Union Home Minister Rajnath Singh on Thursday and requested him to make ways to establish a much improved law and order situation in the capital city. Delhi's law and order situation has just gone from bad to worse in the recent past. The Delhi Chief minister also discussed the appointment of a new chief secretary to Delhi government with the union minister, as the present chief secretary DM Spolia is retiring on Friday. Arvind Kejriwal, chief minister of Delhi, on Thursday sought to meet Haryana CM Manohar Lal Khattar for water sharing and wrote to him in this direction. Kejriwal brought to Khattar's notice that the Haryana state irrigation department had considerably cut down on water supply to Delhi, which could affect Delhi's demands. Arvind Kejriwal led Delhi government finally kept one of its major election promises of slashing power tariffs to half and providing free water up to 20,000 liters of usage. Arvind Kejriwal, Delhi chief minister and MDMK leader Vaiko met on Wednesday. Vaiko emphasised that full statehood was necessary for both Delhi and Puducherry. Whether his party and AAP would work together in Tamil Nadu, Vaiko said, "I do not have any such thought. We did not discuss about it". Delhi chief minister Arvind Kejriwal on Wednesday held a Janata Darbar in Kaushambi where he met 500 people. The Delhi CM held the 'Janata Darbar' from 9.55 a.m. To 12.15 p.m.
Around 50 nursing orderly employees, whose jobs were terminated abruptly, met the AAP convenor and requested him to reinstate their jobs. The central government on Wednesday included Delhi chief minister Arvind Kejriwal into the governing council of the NITI Ayog. He will replace Najeeb Jung, the governor of the NCT of Delhi. The chief minister of Delhi discussed the status of evaluation of private discoms with CAG Shashi Kant Sharma on Wednesday. The Delhi government had ordered the CAG to carry out a scrutiny of finances of the private power distribution companies. Delhi chief minister Arvind Kejriwal joins veteran social activist and his mentor Anna Hazare's protest against the 'Land Acquisition Act' ordinance proposed by the central government. Kejriwal says that the ordinance is anti-farmers. Chief minister of Delhi Arvind Kejriwal took a jibe at Prime Minister Narendra Modi by saying that the people wanted work and not speeches. He said that it was BJP's 'arrogance' that caused an embarrassing defeat in the recent Delhi assembly elections. A citizen friendly pilot project will be launched by the Delhi government so that the people of Delhi can share their views for area specific budget planning for the 2015-16 financial year. The citizens will be able to share their views as to how the government should spend their money. Arvind Kejriwal, CM of Delhi, said on Tuesday. The newly elected Delhi government started the first day of the two day assembly session on Monday with CM Arvind Kejriwal and others taking oath. The assembly and the oath taking process added some spice to the proceedings as MLAs took oath in different languages. Three AAP MLAs took oath in English, three in Maithili and three in Punjabi. Two MLAs from Okhla and Seelampur took oath in Urdu, while one opted for Sanskrit. Ram Niwas Goel, sitting MLA from Shahadara, was elected the speaker. On the other hand, Bandana Kumari, who represents Shalimar Bagh in the assembly, was appointed as the Deputy speaker of the house. The speaker of the house, Ram Niwas Goel said on Monday that he will offer the BJP the status of the opposition in the house. There was an altercation between the speaker of the house and the opposition- the BJP. The opposition party BJP accused the AAP led government of acting under “brute majority”. Taking note of its thumping victory in the recent Delhi assembly elections, the Aam Aadmi Party (AAP) opened an office in the Bhallabgarh are of Najafgarh, Haryana. Arvind Kejriwal, chief minister of Delhi, said on Sunday that the Delhi government was going to slash electricity tariffs and provide free water very soon as promised. A “blue-print” had already been designed for the implementation of the scheme. Kejriwal also said that the free Wi-Fi sheme will take at least a year to be launched. The Delhi Police on Saturday received a tap on the back by the Delhi chief minister Arvind Kejriwal for cracking the petroleum ministry document leak scandal. The CM further instructed the police to find out those had gained benefit from the information leaked. Two Aam Aadmi Party (AAP) MLAs saw FIRs being filed against them and a few of their supporters for being involved in a violent encounter with the police at Burari police station. Six of the errant persons were also arrested. 15 people were injured in the incident. The 28th Garden Tourism Festival in New Delhi was inaugurated by the Delhi chief minister Arvind Kejriwal on Friday. After inaugurating the festival, Kejriwal said that his government was committed towards making Delhi one of the best tourist hubs in the country very soon. It was assured by the Delhi chief minister Arvind Kejriwal on Friday that the power tariffs will be brought down and free water will be provided to the Delhiites soon. Kejriwal said that the promises of launching an Anti-corruption helpline will be fulfilled as well. Anna Hazare's protest against amendments made in the Land Acquisition Act by the government, will be joined by AAP leader if the social activist allows, the party sources said on Friday. The first national executive meet of the Aam Aadmi Party will be held next week, where its leaders will discuss the party's strategies to spread its wings across the nation. The setting up of a commission in a time-bound manner, was demanded by the AAP on Friday for investigating the alleged case of corporate espionage. The media was banned by the Aam Aadmi Party (AAP) led Delhi government from entering the Delhi secretariat. Delhi government provided big relief to street vendors and hawkers by directing the civic bodies and the city police not to remove those who have been working there for years from their occupied place. Indicating that a CAG audit of the various private discoms was essential, the Delhi government moved the High Court on Thursday. The government said that it was very important to establish clarity over the alleged anomalies and manipulation of discoms' accounts which influence the surge in electricity tariffs in Delhi. 40 new drug stores were authorised by the Delhi government to sell Tamilflu tablets to Swine Flu. Two new labs will be set up where tests of swine flu will be done to make it easy for the people. Chief Minister of Delhi Arvind Kejriwal held a 'Janata Darbar' (Public Meeting) at his residence in Kaushambi, Ghaziabad and addressed the grievances of people between 10 am to 12 noon. AAP led Delhi government sought coal blocks from the union government in order to raise a plant to ensure affordable and adequate supply to Delhi. Satyendra Jain, the Delhi Power Minister, said the government had serious plans to increase power generation from various sources. The chief minister of Delhi Arvind Kejriwal gave the US-based radio taxi service Uber a seven day ultimatum to get rid of the discrepancies from its functioning in Delhi. If it failed to abide by the warning, then its license will be cancelled. The Aam Aadmi Party (AAP), after the central government admitted that there were no breach of Foreign Currency Regulation Act provisions while receiving donations by the party, demanded an apology from the BJP for raising fingers over its funding. It will be tried that the Delhi Traffic Police is brought under the ambit of the AAP led Delhi government, the Delhi government said. Aam Aadmi Party (AAP) led Delhi government on Tuesday put a restriction on the termination of services of any contractual employee till a thorough review of the issue was completed. The decision was taken at a high-level meeting presided over by chief minister Arvind Kejriwal on his second day in office. In its election manifesto, the AAP had promised to regularise services of these contractual employees. Media persons were barred from entering the Delhi Secretariat. In response to the move, the media boycotted deputy CM Manish Sisodia's press conference. To implement various schemes and poll promises, the Delhi government will rope in experts from diverse fields to help chief minister Kejriwal. An expert committee is going to be set up in the next few days which will work under the Chief Minister's Office and play a key role in formulation of various important policies. Seeking services of IFS officer Sanjeev Chaturvedi, who is likely to head the anti-corruption branch of the Delhi government, Delhi chief minister Kejriwal has written to the Centre in this regard. legislators appointed to the CMO will be given the position of "parliamentary secretary"